ASUS has long been one of the industry’s most popular manufacturers of gaming motherboards and offers a variety of models spread across a range of price ranges and intended for a variety of gamers. In today’s review, however, we’re going to be focusing solely on the brand’s TUF Z370-Plus Gaming motherboard. Standing for “The Ultimate Force,” TUF denotes this motherboard’s ability to withstand certain forces that would cause lasting damage to lesser models. 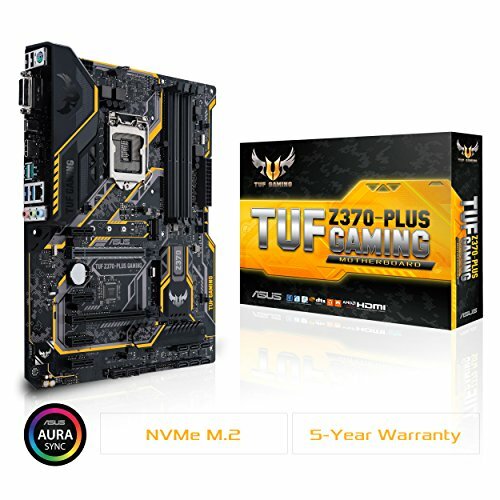 There are actually a number of motherboards available in the TUF series, but the TUF Z370-Plus Gaming, which was first made available online in October of 2017, is considered by many gamers to be the gem of the range. The ASUS TUF Z370-Plus Gaming can be purchased for less than $150 from most sources, so if you’re a dedicated gamer trying to keep costs down it should be high on your shopping list. With a superior cooling system – which we’ll discuss in further detail in just a little bit – this motherboard is suited to regular long gaming sessions. Despite its relatively low price, the TUF Z370-Plus Gaming comes backed by ASUS’ ultimate 5-year warranty, providing peace of mind to even the most of paranoid of gamers. When you purchase the ASUS TUF Z370-Plus Gaming, you will, of course, receive the motherboard itself. When unboxing the product, however, you can also expect to find an I/O shield, the necessary M.2 screws, a driver CD (which you won’t need if you have consistent internet access), and a user manual for easy installation. The ASUS TUF Z370-Plus Gaming comes loaded with features. One of the most noteworthy of those many features is the manufacturer’s OptiMem technology. OptiMem is used to strategically place traces and vias throughout the motherboard to ensure heightened memory overclocking. We mentioned earlier that this motherboard promises superior cooling. It achieves this through the manufacturer’s Fan Xpert 4 Core, which uses hardware-level safeguards to keep all of your fans operating at maximum efficiency. Fan Xpert 4 Core is complemented by this motherboard’s onboard M.2 heatsink, which promises speedy and effective dissipation of any heat that manages to build up. Meanwhile, a selection of 3D print mounts will allow you to fit your board with components designed by you, making for a more personal gaming experience. The ASUS TUF Z370-Plus Gaming is an ATX motherboard, which means it isn’t all that challenging to install in the common computing system. That being said, gamers who have no prior experience with motherboards may experience some difficulty when trying to do so. In order to ensure you correctly install the ASUS TUF Z370-Plus Gaming, we suggest you watch the below video, in which you will be shown how to fit an ATX motherboard in as timely a manner as possible. ASUS is one of the most beloved manufacturers of motherboards in the game. That being said, the brand’s TUF Z370-Plus Gaming isn’t for everybody. If you are a fanatical gamer and believe you require a different motherboard to ensure you fully experience your games, you should take a look at the ASUS ROG Strix Z370-E Gaming. The ROG Strix Z370-E Gaming has many of the same features as its earlier examined alternative, but differs in certain key areas. For example, this motherboard boasts ASUS’ five-way optimization, which is an auto-overclocking utility. If you would like to pursue overclocking but lack the precision needed to manually do so, this motherboard is certainly worthy of your consideration. Also among the noteworthy features of the ROG Strix Z370-E Gaming is its unique lighting system, which comprises dual 5050 RGB headers and an addressable RGB header. This addressable RGB header can be connected to lighting strips, fans, coolers, and PC cases for a visual experience that cannot be expected from lesser motherboards. It is important to note that the ROG Strix Z370-E Gaming goes for about $50 more than the TUF Z370-Plus Gaming, so if you want the additional features you should be prepared to spend a little extra to get them. With the TUF Z370-Plus Gaming, ASUS has created a motherboard that can be used by gaming novices and veterans alike and, in doing so, has further cemented its place at the top of the motherboard ladder. Purchase this motherboard and for just a little over $100 you will receive DTS custom audio, superior cooling, and OptiMem technology for greater memory overclocking. While you will have to sacrifice certain features that you would expect to find from a more expensive model, cash-conscious gamers who are trying to craft a budget system with premium components will have a hard time finding a motherboard more suited to their needs than the TUF Z370-Plus Gaming.